I recently received an advance copy of The Benevolent Dictator, by Michael Feuer (with Dustin S. Klein) and would love to share my thoughts about this brand new book. So lets take a break from the kitchen and the garden and think about how to empower your employees, build your business and outwit the competition! Mr. Feuer was the co-founder and CEO of OfficeMax, and in the course of 16 years he grew the company from one store to 1000. You may think benevolent dictator is an oxymoron, but it actually refers to an authoritarian leader who exercises political power for the benefit of the people, rather than for his own self-interests. This style of leadership works for an entrepreneur who wants to take his or her company on the fast track to growth. Mr. Feuer is a highly energetic man and a risk taker whose brain seems to roll out ideas endlessly. I found that his lively writing style held my attention from beginning to end, and his message is a refreshing change from most business books I’ve read lately. In this day and age the lines between business and social media have become blurred, and we are told over and over that we must bring customers and employees on board, letting them buy into and even help make the decisions of running a business. Mr. Feuer does not subscribe to this belief. He runs the show himself, making important decisions on the fly, changing horses in mid-stream if he needs to, acting first and explaining himself later. 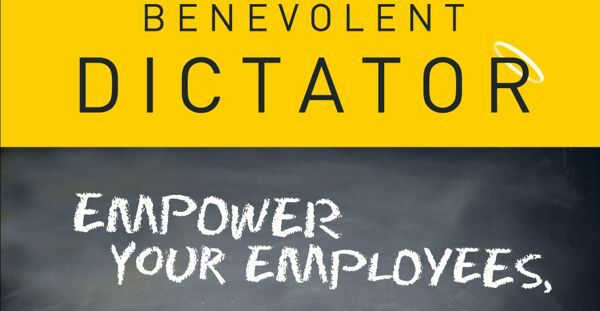 The Benevolent Dictator covers the four key phases of running your own business; The Start-up, Build Out and Put the Idea to the Test, Constant Reinvention and The Payday. Each chapter within these four sections contains a lesson, explaining the nuts and bolts from “How to find the Money to Make Big Money,” to “Pot Stirring 101 – The Key to Continuous Reinvention,” to “How to Tell if the Fat Lady is About to Sing.” There are 40 lessons in all, each illustrated by events taken from OfficeMax or Mr. Feuer’s even earlier workplace, Jo-Anne Stores. Mr. Feuer does his best not to run roughshod over his employees. He makes every effort to show respect and appreciation to hard workers in his business, and quickly shoulders the blame himself when an idea goes awry. However the first priority of this highly self confident leader is the interests of the business, and doing what needs to be done. At one point he explains to his employees that when he asks for something, the please and thank you should be inferred, since he often forgets to actually say them. Catering to people’s feelings and trying to reach a consensus with his partners is not on his agenda. He earns the respect of employees and co-workers through his honesty, openness and the stunning success of his methods. I highly recommend this book for the entrepreneur, or anyone taking the reins of a business. It will inspire you with possibilities, and provide concrete lessons on aspects such as human resources, time and risk management, financing your business and taking it public. Even those who don’t possess the limitless energy and passion to create a business empire from a blank sheet of paper will find Mr. Feuer’s story entertaining and useful.